From mid-August to September 16, 2014, a total of 130 people in 12 states (Alabama, Colorado, Illinois, Indiana, Iowa, Kansas, Kentucky, Louisiana, Missouri, New York, Oklahoma, and Pennsylvania) have been confirmed to have respiratory illness caused by EV-D68. Learn more about states with confirmed cases. A: Since EV-D68 causes respiratory illness, the virus can be found in an infected person’s respiratory secretions, such as saliva, nasal mucus, or sputum. EV-D68 likely spreads from person to person when an infected person coughs, sneezes, or touches contaminated surfaces. A: From mid-August to September 16, 2014, a total of 130 people in 12 states were confirmed to have respiratory illness caused by EV-D68. 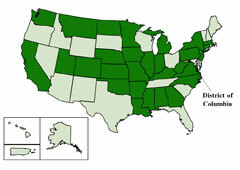 (See States with Lab-confirmed Enterovirus D68.) The cases of EV-D68 infection were confirmed by the CDC or state public health laboratories that notified CDC. Q: What time of the year are people most likely to get infected? A: In general, the spread of enteroviruses is often quite unpredictable, and different types of enteroviruses can be common in different years with no particular pattern. In the United States, people are more likely to get infected with enteroviruses in the summer and fall. A: In general, infants, children, and teenagers are most likely to get infected with enteroviruses and become ill. That's because they do not yet have immunity (protection) from previous exposures to these viruses. We believe this is also true for EV-D68. A: EV-D68 can only be diagnosed by doing specific lab tests on specimens from a person’s nose and throat. Many hospitals and some doctor’s offices can test ill patients to see if they have enterovirus infection. However, most cannot do specific testing to determine the type of enterovirus, like EV-D68. Some state health departments and CDC can do this sort of testing. Respiratory illnesses can be caused by many different viruses and have similar symptoms. Not all respiratory illnesses occurring now are due to EV-D68. Anyone with respiratory illness should contact their doctor if they are having difficulty breathing, or if their symptoms are getting worse. Also, see an graphic that shows these prevention steps. Since people with asthma are higher risk for respiratory illnesses, they should regularly take medicines and maintain control of their illness during this time. They should also take advantage of influenza vaccine since people with asthma have a difficult time with respiratory illnesses. submit specimens (nasopharyngeal and oropharyngeal swabs are preferred or any other type of respiratory specimens) using CDC instructions and complete specimen submission form 50.34.
complete a patient summary form for each patient for whom specimens are being submitted. Please send a printed copy of the form at the same time as specimen submission. follow infection control measures; see health alert for more information.